Gray Hofmeyr began directing television drama in 1975 after training in the United Kingdom and working for the BBC as a floor manager, and started his award-winning scriptwriting career in 1992. He was a key figure in the early days of television in South Africa, having directed the hit series The Villagers and popular comedy series’ People Like Us, The Big Time and Suburban Bliss, as well as several made-for-TV films, and also created and produced the popular South African soap opera, Isidingo, and was its executive producer for sixteen years. Since 2006, Isidingo has won more than twenty team awards for writing, direction, acting and production. 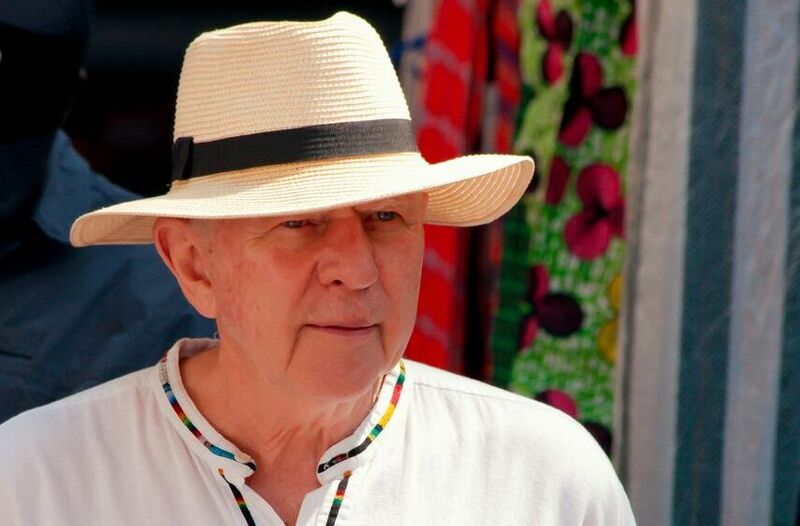 He has also directed many feature films, including the first Jock of the Bushveld, Leon Schuster’s Sweet and Short, There’s a Zulu On My Stoep, Mr Bones, and Mama Jack. In 1987, he produced People like Us, a 26-episode comedy series about a coloured couple moving into a ‘white’ area when it was still officially illegal under apartheid, and in 2016, he produced the comedy series Soap on a Rope for SABC 3. During a career that spans decades, Hofmeyr has received many accolades, including two Tonight! Critics’ awards for Best Director for The Villagers, SABC’s very first soapie; a Tonight! Critics’ Award for Best Director for the made-for-TV movie The Outcast, which is generally regarded as a milestone in South African TV drama; a Tonight! Critics’ Award for Best Director and an Artes Award for Best Director for the made-for-TV comedy Two Weeks in Paradise; Artes Awards for Best Script and Best Director, Tonight! Critics’ Awards for Best Script and Best Director, an Academy of Art and Science Award for Best Script, and a SA Writers’ Association Award for Best Script for The Big Time, a TV series about a Greek immigrant in South Africa. Tell me about Frank and Fearless. What inspired the story? Five years ago Leon and I were discussing our next proper story movie (non candid camera, enough is enough). Primary content element for reaching a foreign audience – Africa. So what is Africa? Vistas, the bush, wild animals, tranquility. killing and plunder. The rhino crisis. Although it’s a comedy, it deals with relevant conservation issues? We thought pretty long and hard about combining comedy with a reality as violent and tragic as rhino poaching. I personally believe that, as long as the story is honest, a script can swing effectively between laughter and tragedy – the further the swing the deeper the emotion, once the audience’s emotions are caught in the roller coaster the laughter and the tears just get stronger. I believe we succeeded. Setting a comedy in a milieu as tragic as the rhino crisis was a controversial decision. However I believe that comedy and tragedy can run seamlessly side by side, complementing each other and enhancing the emotional roller coaster ride, provided the performances and the story are 100% honest. Tell me about your collaboration with Leon Schuster and Geoff Newton on the screenplay . Although Geoff lives in Australia it was a collaboration. Leon and I obviously brainstormed more together, but it went back a forth between all three of us. Then Geoff did the first scenes breakdown. He and I come from the belief that until the breakdown is pretty rock solid don’t bother with dialogue, unless you just can’t stop yourself. Leon comes from a rather different approach which is start writing at the beginning and see where it goes. Anyway Geoff took the first big step, the breakdown, and I am glad he did, he really put a lot of thought into the characters, particularly Leon’s character, Sonny Frank. If he hadn’t done that Leon and I would probably have just written the character as something like his character in Zulu on my Stoep, a bit of a nice guy, but Geoff created a really interesting Sonny – seriously flawed – insecure, delusional about himself, a liar and a fraud. We then batted the breakdown around and Leon got stuck into a lot of the Schuster physical comedy, which he is so good at. My biggest contribution to the physical gags was the bee hive scene (you better go and see the movie) which I had read as a youngster in an early Laurens van der Post book. Geoff then also did the first draft. Another good move because he again concentrated on the characters and he came up with a lot of good dialogue for Sonny particularly, which added more to the Sonny character. Sonny Frank is definitely the best character Leon has played, and I think his best acting to date. Somewhere around then I got stuck into the heavy duty emotional heart stuff and we ended up with a first draft. Then we started getting feedback from people we trusted, did more drafts, again and again, and eventually got a shooting script at draft 14. We have just released the film on 23 November, five years after our first “Africa” conversation. Was it an easy process from page to screen? Making a physical comedy film is never easy, it is like making an action movie – stunts, CGI, in this case a dog as well, etc. Plus there was the character of Reini, the orphaned baby rhino, which we did partially with a life size perfectly executed puppet, operated by three people, for the closer interactions; and a 3D live action animation executed in post production. It is such an advantage for the director to be one of the writers, and in this case also effectively a producer, because I knew from the writing stage exactly what we had to do and also what could not be done. How different is Frank and Fearless from your other films? The merging of broad comedy with strong emotion within a strong story line with a message. What do you think is the recipe for a perfect Schuster comedy? A perfect Schuster comedy is probably Mr. Bones, which as pretty much ongoing huge slapstick gags within a fairly simple yet intriguing storyline, geared to kids and the family. This film is probably not a perfect Schuster comedy, it is bigger, broader and deeper, still aimed solidly at kids and family. How personal is this film to you? I think it is pretty personal, because I really wanted to make a bigger, broader and deeper movie. Leon did too. We have also got international sales firmly in our sights, and this richer story was part of that quest. Writers will always have a future. Good writers are in high demand all over the world. In a way, being a writer in SA is an advantage because there are currently such a lot of tv soaps and films made per capita. If you can, try to sell yourself overseas as well. You have worked in TV and Film, which medium do you prefer and why? I have enjoyed them all -dramatic films like Schweitzer and the first Jock of the bushveld, comedy films like the Schusters, Drama series like The Big Time, TV comedy like Suburban Bliss, and daily drama/soap Isidingo. The only thing I don’t like are short 13 ep tv series – not enough budget, not enough screen time to give it a fighting chance. I love the concentrated effort one puts into a film, and with TV I love plugging in, daily or weekly, to the national psyche. What do you think producers are looking for in a screenplay? Success. Financial success. And that is not a bad thing. Producers are primarily businessmen, they need to be and we need them to be. They need to make profit. If they make profit they will find the finance for another movie and we can keep working. Producers however are also, like us creatives, huge egotists so they also love success for kudos it brings. But if they don’t make profit they don’t survive. Like us, only less so. How much has the film industry changed since your first film? There are probably 20 times as many films made in SA per year than when I made Jock, in 1986. Primarily because 20 times as many people have the opportunity since Mandela was released. Also this government has put a lot of effort and cash into growing the film industry, without the grants from the DTI we would be a lot worse off. Any advice for screenwriters who want to get their work produced? Write your script, get feedback, apply for a grant. What do you think are seven of the biggest mistakes screenwriters make in their screenplay? Believing that their own life story will be fascinating to others. Seeing it from your own POV not the audience’s. Losing objectivity because you get so involved you cannot see the flaws anymore. (get outside input). Not diligently planning your story and structure before you start really writing. What do you hope audiences will get from watching Frank and Fearless? Entertainment and joy. Our hope is that the message of this film will reach all the children of the world and encourage them to ‘stop people killing our wild animals. Why do you think it’s so difficult for SA writers to get their screenplays produced? Is it because they don’t understand the art of collaboration? Not prepared to invest time and money in the development in their screenplay? Or afraid of rejection? Collaboration is great, I swear by it, but in the beginning it might be hard to find. Writers, to begin with don’t have any money to invest, though they can usually make time. I get asked to read a fair number of scripts, and most of them are terrible, because most of them are from first time writers. Rejection is inevitable, embrace it and ask for feedback, try again. Stick to it. I think the best way to start, or develop, is to get experience on a daily soap. But you won’t get a job as a writer on a writing team until you have some experience, so try and get a job as the researcher or secretary or pencil sharpener on a writing team. Find a way to not need to be paid much, go to the executive producer and say you will work for next to nothing if she/he gives you a break, then be on time, work hard, don’t complain, learn. If you have a talent it will emerge.